The Phantoms return home having won 5 in a row after trouncing Wilkes Barre 4-0 last night on the road. Comrie with the hattie, and Brent added a goal. It was the second straight shutout for Martin Ouellette in net. The Phantoms have been eliminated from the playoffs. The Phantoms are currently seventh in attendance, averaging 8,233 per game for the 2015-2016 season. As a road team, the Phantoms are 19-13-3-1, ranked 8th in the entire AHL. At home they are ranked 29th out of 30. 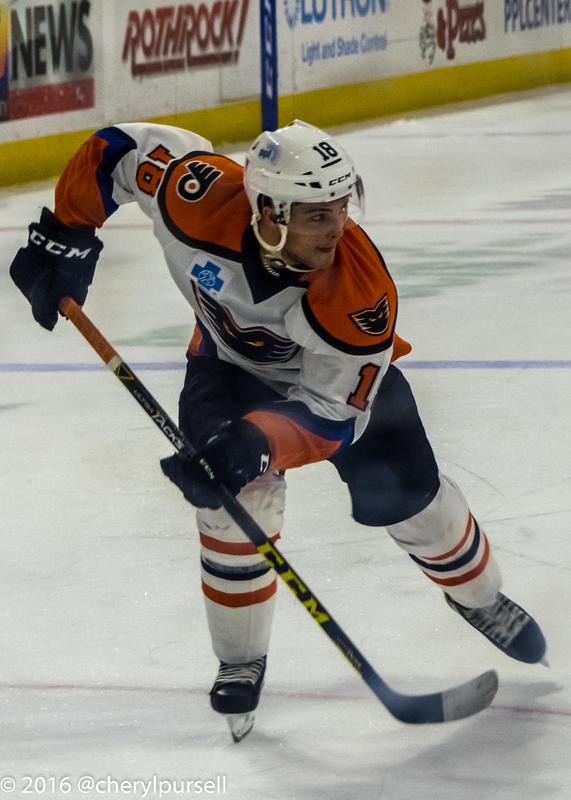 After starting the last few games in a row–including the two straight road shut-outs–G Martin Ouellette was returned to Reading. It may seem cruel, but he’ll be there to help the Royals in the Kelly Cup Playoffs. Anthony Stolarz will be backed up by Connor Knapp for the duration, it appears. The Flyers also signed one of the top goalie prospects available, Alex Lyon out of Yale. Reports are that he will not play for the Phantoms this season. For more information about the young players, how they did in last night’s game, and outlook for the future, please visit our friend Tony’s site Highland Park Hockey. I told you above, but it IS official: The Royals are going to the playoffs! They’ll make a run at the Kelly Cup and we’ll update you as they proceed. For now, they’re the sixth seed and would face Manchester in the first round, but that may change. If they drop to the seventh seed, they would likely draw South Carolina. Reading did well against Manchester in the regular season. The Bridgeport Sound Tigers are in town for a Saturday night tilt. They are currently on the bubble for the final playoff spot in a crossover, if they can stay ahead of Syracuse. This game is important to them. Tickets and Parking: Tickets are scarce for this game. It will likely go to ‘SRO’ by game time, and may sell out. I advise purchasing tickets before you head downtown tonight. There are some available on the secondary market, but not a ton. I also advise parking in a deck facility tonight to get out of the snow. My experience is that they do a pretty good job keeping the roads clean downtown, but sometimes the sidewalks–not so much. Choose your footwear wisely. Promotion: Canned food drive sponsored by GIANT. They will be collected at all entrances, including Chickie’s. You don’t get anything, but you’ll be helping Second Harvest Food Bank of the Lehigh Valley. “Slap Shot Sangria” continues to be offered at the Club Bar as well as the Miller Lite Loft, I’m told. It’s “Faith Night” and there will be a post-game concert with Christian hip-hop artist Tedashii. Broadcast: In addition to the usual suspects for TV and Radio, this game is part of the FMZ-69 Saturday package. PreGame: Mrs. Kram will be picking the pre-game dinner location tonight. Watch those kids, man! Some or all of them should be Phantoms again in the fall. They’ve performed well thus far in the AHL, I’ve heard. It will be great to get a look at them, and one of the only reasons I’m bothering to go to the game at all tonight. Watch Stolie. It’s great to have him back–I voted for him in “player of the year” for the Phan Club–but he could be rusty after getting zero game reps in Philly. I get Philly’s pursuit of a playoff spot and appreciate Mason’s strong play of late, but boy I was hoping Stolie would get in there even for a little. This team has won five in a row–too little too late of course–but struggled at home. I don’t get why. Watch to see if they play with any kind of buzz tonight to try to make their home record look a little more respectable. Watch to see which sweaters they wear. It’s probably the home whites, but I think there’s at least a possibility of alternate orange this evening. They wore road black yesterday in Scranton. The Phantoms will complete the home-and-home up in Bridgeport tomorrow afternoon–also the end of a 3/3 this weekend. Next weekend the Phantoms wind up the 2015-2016 campaign with one last 3/3: Friday at the PPL Center versus the Baby Pens (game goes up against IronPigs), Saturday away at Hershey, and back home for the final game on Sunday afternoon 4/17 versus Syracuse as the season comes full-circle. That last game will make a nice double-header with IronPigs at 1:35PM and Phantoms at 5:05PM. Unfortunately, SteelFC will get squeezed out with their 3PM kick because I won’t be able to get down to Goodman and back into town for hockey without spending too much time driving. I thought about it, though.